These links take you to sections within this page. CLOUDVTB Why should I use it? CLOUDVTB How do I install it? CLOUDVTB is supplied by Innovation Data Processing, and can copy z/OS tape files to private or public clouds in a technology agnostic format, without the need to make any changes to existing tape jobs. This means that the data can be restored to different tape formats, to either physical or virtual tape. The files created by CLOUDVTB can be maintained in multiple locations with a Cloud provider for maximum reslience. CLOUDVTB supports all physical or virtual z/OS tape devices, and IBMâ€™s DFSMSrmm or CA 1 tape management systems. Your Private Cloud could be almost any type of Network File Server, such as Unix, Linux, AIX, Solaris, or Windows. The current release of CLOUDVTB just supports Amazon for a Public Cloud Provider, but Innovation plans to support other Cloud providers in the future. Z/OS processing tends to be used for critical applications, and these applications often have regulatory requirements to keep copies of data for extended periods of time. This data usually ends up on tape, stored as long retention backups and archives. As your tape hardware evolves, you need to keep copying this data to the new technology, or you have to keep older drives around to be able to read older tapes. You might arrange to keep these tapes in an offsite vault, but then when you do need to read it again, you have to wait for, and pay for, the vault provider to bring it back for you. Imagine then, that you could copy this data off somewhere in a format that can be read by any technology, past or future, and let someone else look after it. When you want it back, it might take a minute or too longer than locally held data, but not hours longer. That is exactly what CLOUDVTB does. CLOUDVTB would be especially useful to those with only one datacentre, where they need to take tapes offsite for disaster recovery. Instead of taking tapes offsite, copy them off to the cloud, then you can access the data quickly if your onsite copy expires or becomes corrupt. CLOUDVTB would also be useful if you have a pair of replicated, older Virtual tape systems that need to be upgraded. You could upgrade the local VTS, but send the offsite data to the Cloud, thus avoiding a remote VTS upgrade and saving money. That depends on what you want to do, move all your offsite data into the Cloud, or move selected on-site data. If you plan to move selected data then the first thing you need to do is analyse your tape data. CLOUDVTB provides report that do just that, and below is excerpt of a report for one day of tape processing. Generally speaking, there is not much to be gained by moving data that will expire in 7 or less days. However the report identifies a lot of files on tape that have a retention of more than one year, that were created at least 180 days ago, but have not been referenced in the last 180 days. These are good candidates for expiring the z/OS copy to free up space on your mainframe VTS storage. Now you can start to migrate data. The following is a brief overview, see the documentation from InnovationDP for full details. Your first step would be to take the Option 8 'CLOUDVTB Configuration' from the main CloudVTB ISPF menu and set up some global parameters, including which Cloud you wish to migrate to, and some temporary dataset and tape parameters. Then you define a VSAM dataset to host your CloudVTB database, and a NFS path to associate with this database. 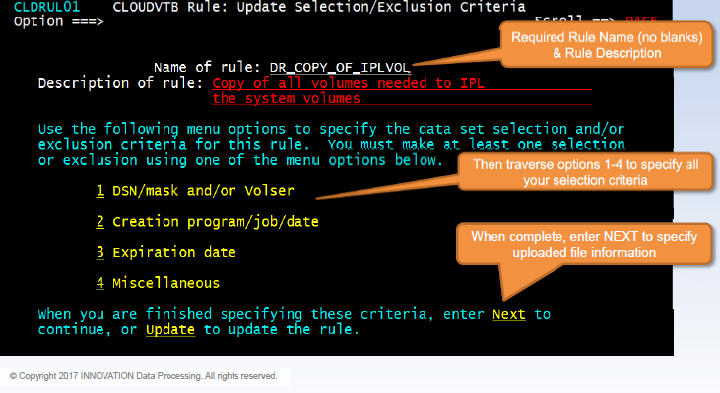 Now take option 1 from the main CloudVTB ISPF menu and define define a new upload rule. From the submenus within this panel you would elect the data that you want to move to the cloud, by a combination of dataset name, tape volser, creating job, creating program, creation date, expiration date or last read date. You then need to decide how long to keep the data in the Cloud, and you can relate this to the data retention set in your tape management system as shown below. This is just a sample of some of the options available. For example, to download data back from the Cloud you would take option 7 from the main CloudVTB ISPF menu Extensive reporting facilities are also available so you can see exactly what data you have stored.